Featured on Kara's Party Ideas! We are so, so excited that our oldest sister, Michelle is pregnant with her first baby! She is due in July, so we threw her a fun mid-century modern baby shower filled with all of her favorite things. The shower was featured this week over on Kara's Party Ideas, so head over there to see all of our inspiration and all the photos from the day! Above is our design board that we created for the shower, full of modern, fresh, colorful and fun elements. 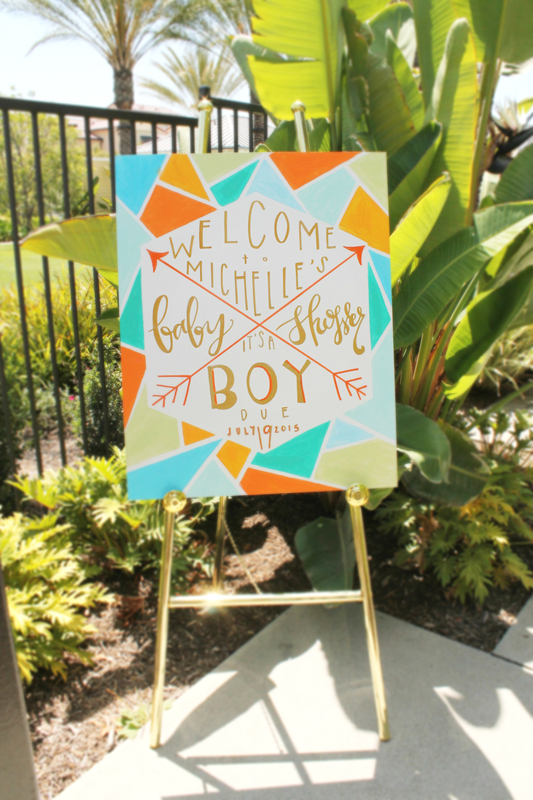 We worked together with our mom to come up with the perfect baby shower theme that reflected both our sister's style and that would suit a baby boy on the way! Our sister's house is full of clean, modern decor, and she has always been inspired by mid-century modern style, so naturally we wanted to mimic this in her shower design. Luckily our mom is very creative and crafty, and she really was the driving force behind all this cuteness. check out the terra cotta cactus planters she painted and planted for each centerpiece! Every table had a different napkin color, either in turquoise, orange or green that coordinated with the same color terra cotta pots and taper candles. This color blocking gave a nice monochromatic and modern feel to the whole shower. And our modern gold flatware and vintage glassware really added a fun element to the overall decor. Head to kara's party ideas to see more. We can't wait for that little guy to pop out, already! !